Portland – It all started when he was in the fourth grade. Matt Fogg went to his high school auditorium for a performance of the wind ensemble. What he heard was the coolest thing ever (at least for an 11-year-old): The soundtrack to “M*A*S*H.” Afterwards, he wanted to learn how to make music, so his dad took him to a pawn shop and bought him a used trumpet. Fogg now teaches sixth-grade vocal music at Lyman Moore Middle School. In warmer weather, he rides his bike from the West End, down Washington Avenue to the Auburn Street school. On the bus ride, students would see him pedaling – the first of many indications that Fogg is not an ordinary choral teacher. By the ninth grade, the trumpet had gotten old. It got especially old when Fogg wasn’t invited to play at the Southern Maine Music Festival. On his way out of the try-outs, he heard someone talking about jazz. About jazz piano. Today, Fogg’s classroom at Lyman Moore is wired with 24 piano keyboards. He teaches four music classes and a chorus class. He also teaches jazz piano at Bowdoin College and the University of Maine at Augusta. He works with the Jewish Youth Chorus. He’s working on producing a comedy CD with his younger brother Ben (though Ben thinks Matt is the funny one). When his sixth-graders ask about gigging, Fogg laughs. “Oh, you guys are too young,” he tells them. Fogg is an easy-going guy with a hard-working ethos. He plays at RiRa and Brian Boru. He plays the old standards. He plays originals. He plays a little of everything. He played two shows last Friday, two shows Saturday and one show Sunday. Fogg played in high school and he played in college. At the University of New Hampshire, he had a blind theater professor who performed scenes from a Braille script in front of the class; he never missed that one. The more his teachers performed, he said, the more he performed. That’s something he tries to pass on to his students. “Music has brought me to a lot of cool places,” Fogg said. And middle school is one of those places. But making money just making music may be unrealistic. All the jazz greats had music gigs. And they also had teaching gigs, he said. “If it were really possible, they’d be doing it,” Fogg said. Fogg had a show last year at Lyman Moore that was something of a hit, if choral enrollment is any indication – this year, it jumped 300 percent. Still, Fogg hopes to make it big. 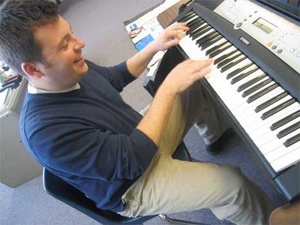 So far, he’s been featured in Keyboard magazine, on Maine Public Radio and WCSH-TV’s “207″. he’s hoping to write one hit song, just one. This entry was posted in Press and tagged 207, Billy Joel, Bowdoin College, Brian Boru, Freddy Mercury, Jewish Youth Chorus, Lyman Moore Middle School, Maine Public Radio, Peter Smith, RiRa, Southern Maine Music Festival, The Portland Forecaster, University of Maine at Augusta, University of New Hampshire, WSCH-TV by Matt. Bookmark the permalink.